Any disorder affecting the Brain is very cumbersome; more specifically when it is Cancer, it is all the more terrifying. Previously, patients affected by this would be really troubled and did not much hope about getting cured or survival because of the lack of apt treatment as well as the location of the tumor would be massive challenge for the specialists to deal with. But today, there is a wide range of cure available, with which Brain Cancer patients have a higher chance of survival. But there are many countries, where the population is deprived of advanced kinds of treatment opportunities. For such patients with Brain ailments, Brain Cancer Surgery in India is very comforting owing to the outstanding facilities available here at uncompromised quality and additionally, low cost Brain Cancer Surgery India is making treatment in India most rewarding. When there is a formation of a cluster or mass of abnormal cells in the Brain, it is Brain Cancer. This can happen from the key Brain cells and other components of the Brain like the membranes or blood vessels, etc. There are malignant tumours, which are very aggressive in nature and overpower the healthy cells in the Brain, by invading into their place and taking their blood and nutrients. These symptoms can also be there is any other medical condition; also, some Brain Cancers might show very few or no symptoms at all. For example, Pituitary Gland tumours or Meningeal Tumours. 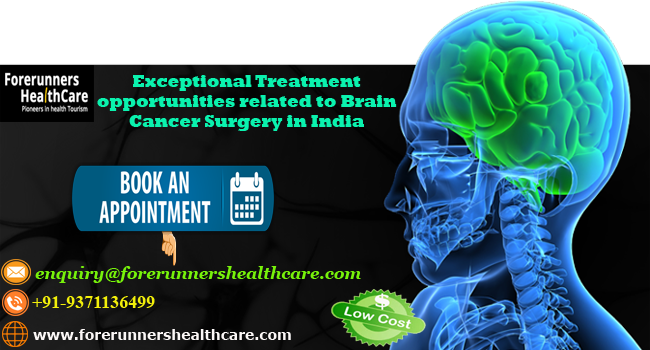 If You are looking for Brain cancer surgery in India and you are searching for success rate of Brain cancer surgery in India, Forerunnershealthcare Consultants will Always help you to give best opinion for best treatment within Your Budget. The choice of treatment depends on the age, health condition, the location, size and the type of tumour and any other health condition that the patient might be having. Although these are extremely advanced, but it is extremely crucial that these are affordable, and this is what makes India so favoured. For example, the cost of Craniotomy is $20,000 in USA, $24,000 in UK and only $4,500 in India. Also, Microsurgery costs $30,000 in USA, $22,000 UK and $7,600. Any medical condition affecting the brain can be undeniable very disturbing and such patients extreme care and attention and that too at the earliest. While in India for any treatment or surgery, we, at Forerunners Healthcare Consultants ascertain that the international patients get maximum treatment benefits; especially through Brain Cancer Surgery advantages India, we try to make things as easy as possible for our patients.